My heart is skipping a beat with hints that autumn is around the corner! Cooler mornings and a dotting of golden leaves on the ground have me dreaming up all the warm-'n'-spiced recipes these days. Fall-inspired pancakes have been sorely lacking from my repertoire, so I had the pleasure of tackling them for my first seasonal recipe. 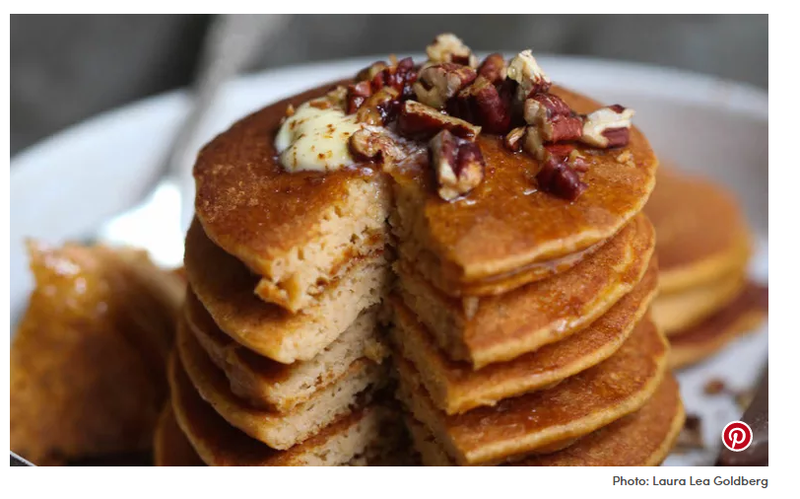 Like any maple-syrup-blooded American, I absolutely adore a hot stack of pancakes, but most leave me scrounging the pantry for something substantial an hour later. Not so with these beauties! These Sweet Potato Pancakes contain an entire half-cup of red lentils, which provides an extra 9 grams of plant protein (plus ample fiber). Lentils in pancakes might sound off-putting, but you cannot taste them in the slightest. What you can taste are tender, lightly spiced, and sweetened pillowy 'cakes that perfectly herald the fall season. I feel incredibly satisfied for several hours after enjoying this dish, and it's already become a staple in our home.